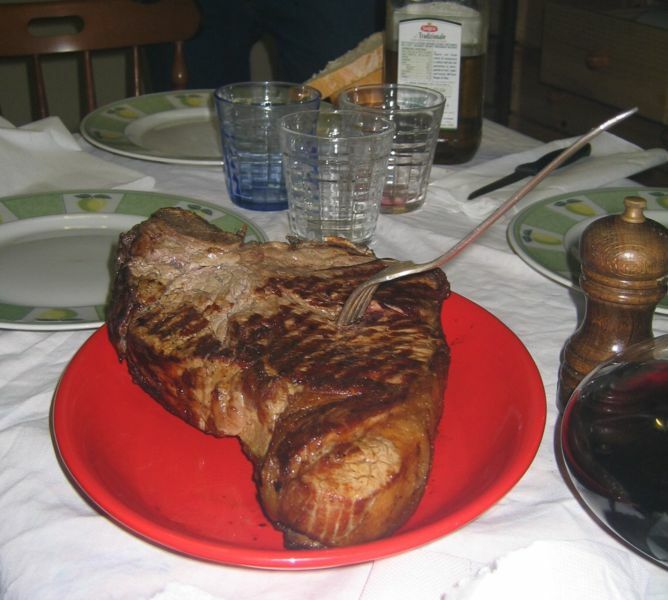 A favorite of Tuscan cuisine, bistecca alla fiorentina 'beefsteak Florentine style' consists of a T-bone or porterhouse steak (traditionally taken from either the Chianina or Maremmana breeds of cattle), grilled over a wood or charcoal fire, and seasoned with salt and, sometimes, black pepper, and olive oil. Thickly cut and very large, steaks are often shared between two or more persons. Bistecca is invariably served very rare, sometimes garnished with lemon wedges if not accompanied by red wine; Tuscan beans are the usual side dish.